LIC New Term Assurance Rider Plan provides a life cover to assured’s family in case of unfortunate or sudden death during the cover period. This plan can be attached to the basic policy to add some additional benefits at a nominal cost. The riders shall be attachable only with non-linked plans at the inception of the base policy. The Unique Identification Number for the policy is UIN: 512B210V01. Assurance is provided for the people to have investment along the insurance policy. There is a chance of getting some profit along with the company. The Life assured who wants to add an additional benefit to their basic policy can add this rider to the basic policy. It will give an additional financial support to the Rider and Family Members. The terms and conditions also based on the basic policy only. LIC New Term Assurance Rider Plan has some features and Benefits. These benefits are helpful for the better understanding of the plan. 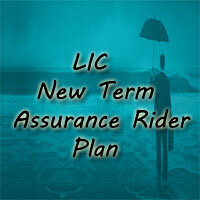 The grace period for the LIC’s New Term Rider Plan is same as the basic policy. For payment of yearly, half-yearly or quarterly, rider premiums grace period of one month but not less than 30 days will be allowed and 15 days for monthly Rider premiums. Along with the basic policy, a lapsed policy can be revived within the two consecutive years from the date of first unpaid premium. This Term plan will be revived before the expiry period of Policy term. If you are not satisfied with the Terms and Conditions of the Policy, you can return the LIC New Term Assurance Policy within the 15 days from the Date of receipt of the Policy. Based on the receipt of the same, the corporation shall cancel the rider. The Company will return the premium deposited for the rider. The proportionate risk premium will be deducted from the premium returned to the rider. A rider is an add-on provision to a basic insurance policy that provides additional benefits to the policyholder at an additional cost. For every policy, there are some key benefits for the Life assured. Based on the policy terms and conditions benefits will be provided for the Rider. The benefits will be given in a case of unfortunate death of the Life Assured during the term of Rider. In a case of the Sudden/ Unfortunate death of insured candidate within the Rider term, an amount equal to the Term Assurance Rider Sum Assured shall be payable. In the case of survival of the life assured up to the end of the term of Rider, no benefits will payable. A rebate is the portion of interest earned by the owner (lender) of securities that are paid to a short seller (borrower) of the securities. Premium Rebate is available only for half Yearly mode. No Rebate is available for the Yearly mode. Mode Rebate: Same as the Basic Policy/ Plan. High Sum Assured Rebate: No Rebate will be provided. How to buy LIC New Term Rider Assurance Policy? The buying procedure for LIC New Term Assurance Rider Plan will be same as the basic policy. Which means the documents required for the Plan are same as the Base Plan. The Policyholder who want to buy a rider assurance plan should follow the rules that are applicable for the Basic Insurance Plan as Assurance is a Protection against an event that is definite. Nominees can claim for LIC New Term Assurance policy after the death of the policyholder. Because there is no Maturity/ Survival Benefit under this plan. Exclusions for this LIC New Term Assurance Rider Plan will be based on the basic plan. Suicide Clause for the LIC New Term Assurance Policy will be applicable as mentioned in the basic policy.This rider can not be issued on the stand-alone basis and shall be attached the with the basic plan. In this LIC New Term Assurance Rider Plan, Loan facility is not provided. There is no requirement of any paid-up value for the Term assurance rider. Surrender Value: No Surrender Value will be available under this rider. But there a chance payment of surrender value based on the Premium we have taken. Check the following conditions for having the surrender value. Regular Premium Policy: No Surrender valu will be payable. Limited Premium Paying Policies: In this Surrender value will be payable based on the minimum policy term. Singel Premium Policy: The amount to be refunded shall be 90% of the single premium for the Rider multiplied by a ratio of an outstanding term to original term of the rider. 1. What is Life Assurance? A. Life assurance is not a fixed-term product — it’s intended to cover you until you pass away, whether that’s weeks or decades after you’ve bought the policy. 2. Why should add this Rider Plan to my basic policy? A. The LIC New Term Assurance Rider Policy can be attached to the basic policy to add some additional benefits at a nominal cost. 3. Can I have loan Facility to this plan? A. It all depends on the basic policy you have taken.